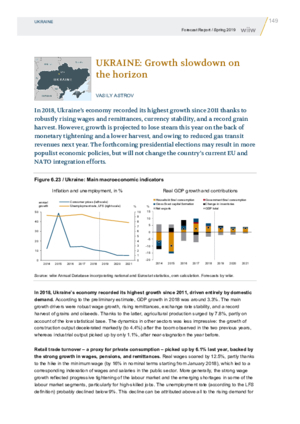 In 2018, Ukraine’s economy recorded its highest growth since 2011 thanks to robustly rising wages and remittances, currency stability, and a record grain harvest. However, growth is projected to lose steam this year on the back of monetary tightening and a lower harvest, and owing to reduced gas transit revenues next year. The forthcoming presidential elections may result in more populist economic policies, but will not change the country’s current EU and NATO integration efforts.